Louise O’Hare of Publish and Be Damned (PABD) talks to Nick Thurston of information as material (iam) about the impulse to self-publish and the possibilities it affords. 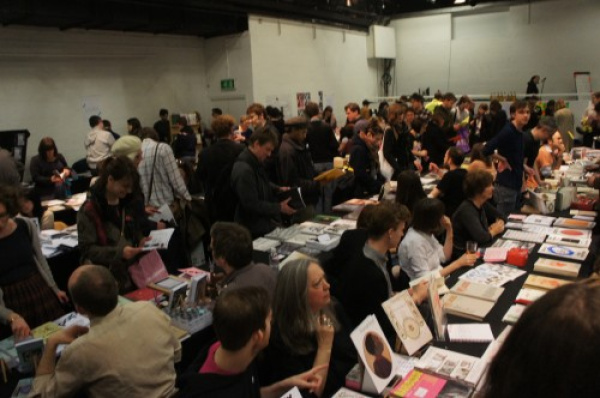 PABD is an organisation that discusses and promotes alternative directions in publishing and is best known for its self-publishers’ fair which this year occupied the Institute of Contemporary Arts, London with stands of small-scale publishers involved in areas from architecture to slash fiction selling and swapping their wares. Iam is an independent publishing imprint based in York. Nick and his fellow iam editors, Craig Dworkin, Simon Morris and Simon Zimmerman, were recently Writers in Residence at the Whitechapel Gallery, London. Their last exhibition, ‘Do or DIY’ (March – April 2012), and the pocketbook that they published to accompany it, presented an anecdotal micro-history of self-publishing. Louise O’Hare: I thought I might start by commenting on the Afterall editor's suggestion that we reflect upon the ‘impulse’ to self-publish. Compulsion, appetite, desire, urge… reflecting upon motives in such terms sounds a little bit seedy, but she might have neatly encapsulated what is potent about ‘self-publishing’ as a strategy – the personal and the urgent. Your exhibition argued for a positive understanding of self-publishing, and carried the empowering instruction ‘don't wait for others to validate your ideas – DIY’. DIY is about taking the initiative and finding your own solution. Embraced by counter-cultures, it suggests a subversive disdain for the professional. It also references the domestic and private – DIY is used to describe home improvement without the aid of experts. The examples of self-publishing you included in your exhibition were likewise wide-ranging, from The Joy of Cooking to Martin Luther’s Ninety-Five Theses, and included a variety of types of writing – literary, instructive, religious and political. Can such broad categorisations actually mean something? Nick Thurston: Broadly speaking, I think we need to recognise publishing as a specific field of practice and theory, akin to a ‘discipline’ in academia. It’s similar to the challenge that has faced curating and exhibitions history since the 1990s: how to develop a sophisticated meta-consciousness about a field of action that many assume to be secondary or to overlap with already established disciplines of knowledge, like art history. For me, the fluidity, intensity and constancy of the textualities (the qualities and uses of all of the many things we now conflate under the term 'text') that are made public in contemporary life, coupled with the general over-production of publications now, deserves to be situated and critiqued in a sensitive way vis-à-vis its cultural status. More specifically, in ‘Do or DIY’ Craig, Simon and I wanted to unveil some of the ways in which canonisation (as a historiography) conceals inconvenient truths. The pocket book contains a two-part essay: it starts with a non-linear, anecdotal history of writers who self-published their work and have since been integrated into the English-language canon, like Laurence Sterne or Derek Walcott. It finishes with a straightforward polemic that points to the technological and political potential of self-publishing as a positive praxis for writers now. In the show, the essay was set onto the gallery walls. Within the galleries seven of the rare self-published editions mentioned in the essay were on display in vitrines – with their colophons or title pages exposed – alongside a beautifully honest letter from Kathy Acker to Paul Buck in which she described some of her insecurities about self-publishing Great Expectations. On the floor, leaning against the gallery walls, we placed contemporary reprints of all of the books mentioned in the essay. The particular editions of these reprints were chosen according to cover image and price on Amazon.com. Mass-reproduced by a mainstream industry, the supposed ‘main body’ sections of these books go through various and weird textual transformations and the colophons and title pages of these reprints repress their self-published origin. The Oxford World Series version of The Life and Opinions of Tristram Shandy, Gentelman (1759–1767) that we included on the gallery floor for ‘Do or DIY’, for example, presents a generic low-grade greyscale blotch in place of the once unique, full-colour marbled page that was so overtly a conscious part of Sterne’s writing and Sterne’s story. We describe the PABD fairs as for ‘self-publishers’ but, perhaps contradictorarily, have a rule that publishers shouldn’t be simply promoting themselves – we’ll avoid artists selling traditional catalogues of their own work for example. We try and differentiate between the self-published and the ‘vanity press’. NT: Similarly, at iam we try to unfold one specific sense of ‘self-publishing’, seeing it as a kind of cultural production other than vanity publishing. Vanity presses mimic the structures and behaviours of those presses on the inside of the mainstream of publishing, so as to centre the ego whose vanity is to be impressed (upon us, the public and back upon itself, the vain self). Although one ego might control the means and agenda of production at a vanity press, the label in no way demands that the subject of that ego does the work him- or herself nor take responsibility for it. This is what differentiates the subjectivity of the ‘self’ put at stake (or not put at stake) by vanity publishing from the subjectivity put at stake by self-publishing. In the kind of self-publishing that our organisations support, the ‘self’ is put at stake through work and the self takes responsibility for engaging in a different kind of work from that done by and for mainstream publishers. This self takes responsibility for working to produce a different kind of publishable text and a different culture of publication, and it does so from outside the mainstream as a positive choice. When the mainstream industry publishes works that involve failure, hobbyism, pleasure, desire, etc., it needs those dynamics to have been safely expended in the process of producing the manuscript because it can’t risk them still being dynamic in any uncontrolled way once reproduction has begun. LOH: There is also now, particularly around recent discussions on ‘art writing’, a tendency to conflate writing and publishing – perhaps because when we discuss art there is an intrinsic conflation of form and content. Might we describe self-publishing as a moment where form and content merge? NT: I agree – mainstream publishing industries depend upon a differentiation between production and reproduction (the process that reproduces the product after its drives, desires and changes – basically its composition – have been settled). Thus it is possible to render the product into units – a commodity state perfected by capitalism. But drives can still be part of a mechanised production process – think of the Apostrophe Engine or Alvin Lucier’s work.2 The mainstream publishing industry might innovate ways to represent those dynamics or their benefits – this is basically what Research & Development does – but it won’t reproduce those dynamisms as live forces in the final product. That’s partly how ‘massifying’ industries guarantee a consistent product – by safely representing their products as units or once unique objects – and many of the reproduction technologies of today are developed by and for that standardising mentality. Software like InDesign are a perfect example: it has never been easier to re-present Futurist poetry than it is now. In a neoconceptualist way, the burgeoning over-presence of graphic designers parading as writers in the more fashionable spotlights of art publishing attests to that. LO’H: Reflecting on the expanded notion of self-publishing your exhibition presented, I wondered why you didn’t include Daniel Buren’s illegal fly-posting of the streets of Bern in response to the exhibition ‘When Attitudes Become Form’ (1969), which he wasn’t invited to. Following Broodthaers’s observation that the ‘definition of artistic activity occurs, first of all, in the field of distribution’, could one could describe all artists as self -publishers? The kind of self-publishing that we do at iam is based on a process of reproduction-as-production that marks the form of the content but not necessarily the content itself (even if form and content are mutually dependent). This process tries to open up the text to the possible affects of the whole process of reproduction-as-production, rather than just designing a safe process for reproducing a stable manuscript. This kind of self-publishing extends the artistic drives normally restrained to the composing of the manuscript into the processes normally reserved for editors and designers and marketing departments. Sometimes this implicates material aspects, like paper choices or paratext, and sometimes this is about external work, like context building. These extended kinds of textualities basically refuse the idea of the transferable manuscript. A privileging of the transferable manuscript seems to me to underwrite the way that the literary industry understands the constitution of authorial identity. I imagine that authoriality as authority would always be one key issue for something like a discipline of publishing. LOH: Are you suggesting that the authenticity of intent might be, not simply reproduced or repeated, but generated through publishing? Buren’s flyposting can be read as ‘reproduction as production’, but I am more interested in it as an independent, solo action – contesting the authority/ideology of the exhibition. NT: The constraints we’re interested in at iam are performative conditions for writing art. In terms of methodologies, constraint-based procedural composition found its way back into the late-modern and contemporary arts via practices like the Oulipo and Conceptual art. In itself, constraint-based writing can be an interesting formal experiment, a training exercise, or a way of displaying virtuosity. Personally, I’m less interested in how a conceptualist approach can test the resolve of a writer’s subjectivity – as if the imposition of a formal constraint tested the writer’s knowledge or skill. I’m more interested in how it can displace a writer’s subjectivity – that is, as a kind of desubjectivation. But I’m not interested in replacing subjectivity with objectivity – I don’t want to be a machine. For me, objectivity is interesting because of the way that objective methods actualise otherwise unimaginable things, and how, in doing so, they bring the subjectivities of the people/things involved into play. Conceptualism implies a pact with your audience, i.e. that you’ve done what you said you’d do to arrive at an unimaginable outcome. But I believe in affectivity of the experience of the artwork, so what matters most to me is actually experiencing that otherwise unimaginable outcome, and I most enjoy having the experience when that outcome is in some kind of conceptually productive tension with the context ‘art’. When you have that experience as a reader it displaces your readerly subjectivity; when you have that experience as a writer it displaces your writerly subjectivity. For me, self-publishing doubles up those displacements, and together those displacements keep re-opening the experiences of authoriality that I have as a writer and reader of one kind of writing that is happening beyond the territory of conventional literature. Afterall will be at the New York Art Book Fair presented by Printed Matter, Inc. Visit MoMA PS1 for special subscription offers to Afterall journal, and to pick up copies of books from our Exhibition Histories and One Work series. Nick Thurston considers writing as a focus of the recent Documenta and discusses the proximity between literary production and reception at the writing retreat set up in Kassel.